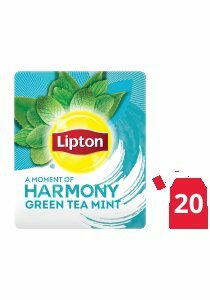 Lipton Green Tea Mint with the refreshingly pleasant mint flavour that's well preserved in an elegant envelope. Made from delicate young tea leaves, its blend of green tea and spearmint leaves makes for a truly delicious tea. The tea bags are packaged in envelopes, so you get the same crisp taste and aroma - from the first tea bag and the last.